The Farewell of Bellator ! Stars's Cities of the Stellars ! The Celestial Militia of the Stellars ! The Legacy of the Polymorphic Alien Gods ! New Contacts with Aliens ! National Defense & Territorial Security against UFOs ! Are we the human Cobbayes of the Aliens ? Evidence of the Existence of UFOs ! Are Invaders Exogenous already among us ! The survivors of the Ufological Portals ! Disappearances & Disturbing Abductions of People ! The spider web Woven by UFOs ! Alien Chemtrails & Angel Hair ! Super Technology of Extraterrestrial Chemtrails !Extraterrestrial Transcendence ! The Bel Alien & the Terrienne Beast ! The Polymorphous Christmas stars ! Does the Earth serve as an experimental laboratory for Aliens? The opening of the Ufological Vortex ! The Extra-Terrestrial Butterfly Effect ! The Star's Order of Extraterrestrial Ambassadors ! The Key of Extra-Terrestrial Contact ! Et In Arcadia Ego & the Tomb of Christ ! Spatial and Temporal Capsules ! The Extraterrestrial Bases in our Solar System ! The Shock of Terrestrial & Alien Civilizations ! The Ninth Extra & Terrestrial Crusade ! The Extraterrestrial Invasion of the Earth ! The War off Three Worlds ! Palingenesis of the Ancient Cosmonauts ! The Protective Ideology of the Ancient Cosmonauts ! The End of the Extraterrestrial Horseflies ! "The Humiles Pecator" of the Ultra-Terrestrials ! The Gate of Heaven ! The horizon of ufological events ! The signage of Extraterrestrials ! The Extraterrestrial Future of Humanity ! Physics and Ufological Metaphysics ! Extra - Terrestrial Recycling ! The Alien Grip on the State of the Vatican ! Planet Nibiru is back ! The Celestial Militia Extra - Terrestrial ! Who owns the Earth ? The Visitors from the Stars ! Human & Extra-Terran crossover ! Occupied Territories by the Poly-Metamorphs ! The Invasion of the Alien Chimeras ! The Endogenous Hunting Ground ! The Permanent Coup d'Etat for Alien Visitors ! The Extra - Terrestrial Crusaders ! Alien Predators and Extra-Terrestrial Visitors ! Psychic Hybridations of Aliens ! The New Prophets of the Extraterrestrials ! The UFO Spider Web ! The Visitors of the Time ! UFOs & Flying saucers ! The Global Occult Power ! UFOs & the Order of the Temple ! The Keys of Heaven ! The reason for the coming of our extraterrestrial visitors ! The Close Encounters seen from the UFO side ! The Occult History of Humanity ! The Secret Alien War ! The Alien Circle of Möbius ! Are Aliens Among Us ? Welcome to Extra & Terrestrial ! The Extra & Terrestrial Mother Civilization ! Back in the Stars ! The Supra - Terrestrial ! The Cabal Infra - Terrestrial ! The Occult Alliance of Ultra-Terrestrres & Extraterrestrials ! The Promised Land of Stars ! Invasion of the Utra - Terrestrial ! The Return of the Great Monarch ! The Sarcophagi of Regeneration Extra & Terrestrial ! The Holy Grail Extra & Terrestrial ! The Extra & Terrestrial Induced Doors ! The King of the Worlds ! The Apocalypse of the Civilizations's Shock ! UFOs : The Secret War ! The Extra-Terrestrial Approached Contacts ! The Invasion of Alien Barbarians ! Contact with the enemy Alien ! Welcome to our alien allies ! Flying saucers & UFOs ! Aliens: Those of the outdoors & those of the inside ! David Vincent was right ! The Aliens of the Extra - Terrestrials ! The Ray of Death ! The Shield of Stars ! The Extra - Terrestrial Shuttles ! The Terrestrial Militia of the Celestials ! The Utopia of a New World ! The Aliens - Vampires ! UFOs & The Doors of Time ! The Extra-Terrestrial Sand Grain ! Ufo - Logic Débriefing ! The Alien S. O. S. ! UFOs & Induced Doors ! UFOs & Wells at Energy Potential ! The Ring of the Nibelungen ! The UFO Crusade : The book ! The UFO termite mounds ! The Earth's Extra and Terrestrial Colonization ! The Ufological Secret Weapon ! The Quest of UFO Researchers ! Invasion and Migration Alien ! The Opening of the Portals to the Aliens ! The Ufological Syndrome of the Wizard of Oz ! The Aliens Visitors of Exteriors and Interiors ! Communication with the Aliens ! The Dream of Extra - Terrestrial Contact ! UFOs - Secrets of States ! Invasion of the Body Snatchers Aliens ! The grains of Aliens sand ! The "Crabs of Venus" and the "Rats of Mars" ! Valensole and the Real RR3 ! The Song of the Sirens Extraterrestrials ! The War of the Titans and the Extraterrestrial Gods ! The "Secularism Cultual" and "UFO-presence" ! The Extraterrestrials Hunting and the UFOs Fishing ! The Forces of the Inter-Galactic Continuum ! The Moons of the UFO Hunters ! The Territorial Interference of Aliens ! The Opening of the Ufological Portals ! 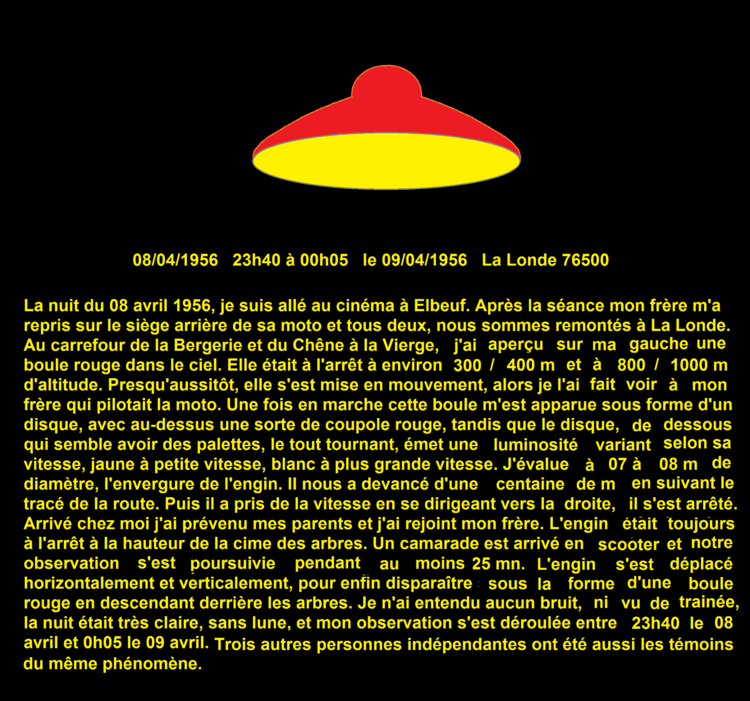 The Little and the Great Mysteries of UFOs ! The Counter Attack at the Alien Invasion ! The Extra and Terrestrial Threat ! The Claw of the Aliens ! Terrestrial Signage of the "Intruders" Extraterrestrials ! An Extra and Very Terrestrial World ! Mobilization Against the Occupation Alien ! The Representatives of Another World ! Official Recognition of Extraterrestrials ! The Clash of Civilizations ! The Extraterrestrial and Terrestrial Collaboration ! The States of the Earth and the Extraterrestrials ! These Aliens Who Are Among Us ! Those of the Outside ! 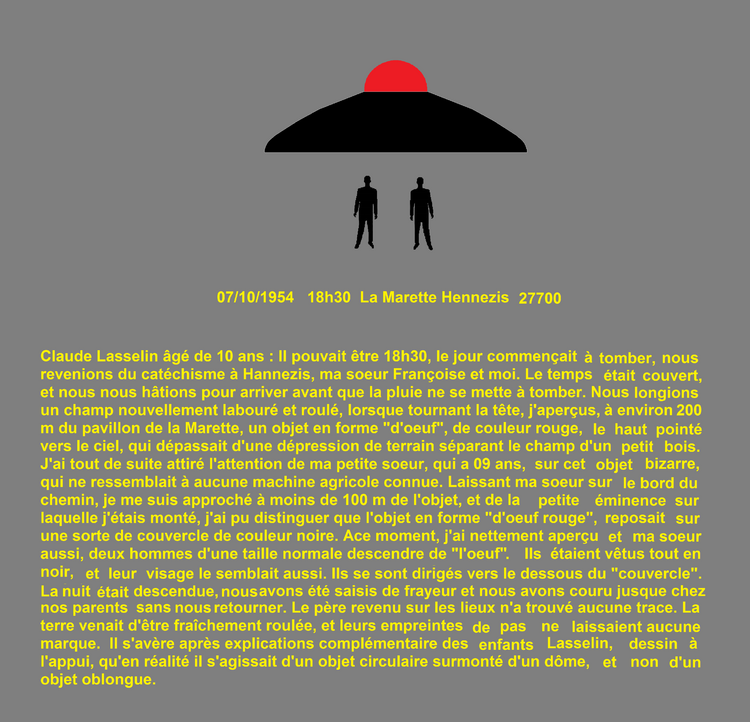 The Extraterrestrial Myth and Terrestrial History ! Angels of the Mist ! The nests of flying-saucer ! Les Ovnis en Normandie - En Images ! Pouvez-vous revenir sur les Rencontres Rapprochées de vos Collaborateurs avec ces Créatures supposées Hybridées, ou Homo-Aliénus, comme les nomme David Jacobs ? Vos Collaborateurs ont-ils pris contact ou échangé avec eux ? Alors, ... que nous veulent-ils ? si je vous le dis, tout net, ... vous risqueriez d'être déçu ! Tant pis, je prends le risque ! hé bien c'est simple, ces « Curieux Personnages Humains Hybridés ou Hubridés », comme l'affirme David Michael Jacobs, semblent vouloir effectivement tout apprendre de nous ! ils nous approchent, nous côtoient, se mêlent à nous comme s'ils voulaient nous observer de près et tout connaître de nos habitudes, de nos attitudes, de nos pensées, de nos sentiments, etc. ... sans doute pour s'en imprégner, nous assimiler, et peut-être nous répliquer ? absolument pas, ... je dirais même bien au contraire ! Ne me dîtes pas, qu'en cas d'affinité ... ils développent ou approfondissent plus à fond leur « Sujet » ? tout ce que je peux vous dire ... c'est qu'ils sont des étudiants passionnés, persévérants ... & plutôt très studieux ! ... maintenant il faut aimer ... le « genre Robocop » ! C'est des machines biologiques ? Vous semblez bien les connaître, vous avez dû vous aussi en croiser quelques uns ? ce n'est pas impossible, ... mais je vous rassure ... en tout bien et en tout honneur ! Même pas à l'insu de votre plein gré ? Même si ce n'est pas sur l'oreiller, ils doivent parfois se laisser aller à quelques confidences ? oui, ... mais lorsqu'ils parlent, ... on a comme la désagréable impression qu'ils vous disent ce que vous voulez entendre ! Sont-ils indépendants ou de simples exécutants ? Qu'entendez-vous par Autorité Céleste ? Si je vous suis bien vous êtes en train de me dire, que ces « êtres robotisés », que la plupart prenne pour des hybrides d'extraterrestres, seraient en réalité les fameux « Cent Bras aux Cinquante Têtes » qui ont hérité du Tartare ? ... mais qui s'ingénie à ouvrir ainsi les Portes de notre Monde aux Résidents du Tartare ?